InSite_05 is one of the broadest and most massive art programs in the region. It transcends the U.S.-Mexico border, defies categorization and often feels more like social experiment than art installation. Francis Als' "Ambulantes II," on display at the San Diego Museum of Art in "Farsites: Urban Crisis and Domestic Symptoms in Recent Contemporary Art." The exhibition is part of inSite_05, a cross-border program of new projects in public spaces. The contemporary arts program involves more than 100 artists hailing from 15 different countries, and includes a two-city museum exhibition, 24 public programs and performances, an online segment and public art "interventions." The interventions are aptly named, as they seek to foster collaboration between artists and the community. These are no mere site-specific installations -- the works are at the intersection of the artistic and public spheres, challenging the traditional notion of public space and public art. Take, for example, Los Angeles artist Mark Bradford's "Maleteros" project. 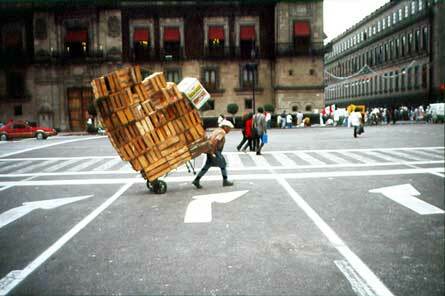 Bradford spent a year studying and talking with the porters, or maleteros, who cart bags for pedestrians crossing the border. Then he helped organize them into a more efficient, cohesive network, providing them with new shopping carts, dollies and other equipment. If you catch Bradford at the site, you can get a better understanding of what the porters do, and how they've organized themselves in the region. But you might have difficulty even finding the spot. Bradford's intervention is set up in a small shack of an area on the Mexican side, near the U.S. Consulate just before the border. But even if you did find it, the whole thing might strike you more as a sociological undertaking than an artistic one. More tangible is a project just beyond the gates along the pedestrian walkway at San Ysidro. There, a series of solar water sills purifies water in the most basic, cost-effective manner in artist collective Simparch's "Dirty Water Initiative." Spearheaded by Matt Lynch and Steven Badgett, the installation has the elegance of techno-sculpture, with functionality to boot -- the apparatus yield about two gallons of potable water on a good day (the sunnier, the better). But this intervention has a social purpose as well. When the show ends in November, the clean water systems will be donated to families throughout Tijuana neighborhoods. There are a few such interventions on this side of the border, too, including Swedish artist Mans Wrangel's "Good Rumor Project." The site for this project is located on L Street downtown, across the street from the Omni Hotel, but the action takes place throughout the border region. The idea is to plant a "good" rumor about San Diego among Tijuanans and another positive rumor about Tijuana among San Diegans, then track the progression of the rumors on the Web site www.thegoodrumor.com. What are the rumors? You'll just have to hear it on the street, because the display downtown doesn't give anything away. But you will learn that the rumors were created via focus group -- which probably means they aren't anything too juicy. Another piece of art in unlikely spaces is Amsterdam-based Aernout Mik's film project, "Osmosis and Excess." Located on the lower level of a parking garage on Sixth Avenue, between K and L streets near Petco Park, Mik's three-screen-wide film alternates scenes of a massive Tijuana auto junkyard, kids smashing pinatas and a sterile Tijuana pharmacy slowly torn apart by construction workers as sleepy-eyed pharmacists sit idly. The narrative-less, plot-less film loop has something to do with discarded cars moving south while cheap drugs come north. If you like your art more traditionally displayed, you can check out the exhibits at both the San Diego Museum of Art in Balboa Park and the Centro Cultural Tijuana. This is the first time in the five-time history of inSite that a large-scale museum exhibit has been created. "Farsites: Urban Crisis and Domestic Symptoms in Recent Contemporary Art" features artworks in a range of media -- painting, sculpture, photography and video -- that address moments of crisis and fissure effecting everyday urban and domestic spaces, according to inSite organizers. A few other components of inSite include Conversations, a series of lectures and symposia with renowned artists, curators, art historians and others; and Scenarios, commissioned artworks in new media, including online projects, a live sound and video event and a mobile archive project that will move between San Diego and Tijuana. There are also more single-day events and performances coming up. If it all sounds a bit daunting, it is. The best way to tackle inSite is to hop on one of the shuttles during the big-event weekends (Sept. 23-25, Oct. 21-23 and Nov. 11-13). Buy a transport pass and you can circulate among the various sites, exhibits and events on both sides of the border. For starters, head over to the Web site, www.insite05.org. Or check out the infoSite information booth outside the San Diego Museum of Art -- it looks like a giant play structure with orange safety cones and oversized bean bags -- and have yourself an intervention.